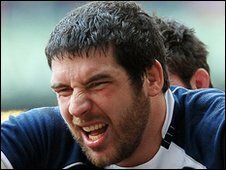 Gloucester have signed Scotland's former Leicester lock Jim Hamilton from Edinburgh on a two-year contract. The 27-year-old, who has 28 international caps, is in the team for Saturday's Test against Argentina. Cherry and Whites coach Bryan Redpath told BBC Radio Gloucestershire: "Jim had other options but he sees coming here as the right rugby decision. "It's hard to compete with the French clubs but Jim didn't only think of the financial side of things." Hamilton's arrival will compensate for the departures of Marco Bortolami and Adam Eustace but Redpath insists that Hamilton is not a straight swap for either. "He's a big man with an angry edge," said Redpath. "And you need a bit of niggle. "He'll push Dave Attwood, Alex Brown and Will James massively. "He's comfortable calling the line-outs - he's done that for Edinburgh and Scotland - so all four will have to fight for their places." "Jim is ex-Leicester, he's played here for them, and he wants that kind of club atmosphere again. "He enjoyed himself at Edinburgh but it's time for him to push himself in the Premiership."